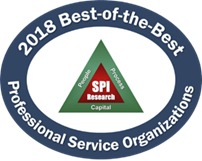 TOP Step Consulting, a leading provider in delivering professional services automation solutions, has once again been recognized as “Best-of-the-Best” in the professional services industry in a benchmark survey conducted by independent research firm Service Performance Insight (SPI). This is the company’s eighth year being among those honored with the title. TOP Step Consulting specializes in improving business efficiency and productivity for Professional Services business operations through process improvement and implementation of professional services automation technology aligned to the organization’s business model. The Best-of-the-Best professional services organizations excel across five critical service performance dimensions: leadership, client relationships, human capital alignment, service execution, and finance and operations. The Best-of-the-Best recognition is significant because it measures PSOs not only on bottom line financial results such as profit margins but also on a breadth of leadership metrics to reveal exceptional, holistic performance. According to SPI’s PS Maturity™ Benchmark report, the top 20 firms out of 456 consulting organizations who participated in the survey, outperformed their peers and the benchmark average with not only significantly higher profits but also more projects delivered on-time and many more satisfied clients. The annual benchmark from SPI Research draws on a database of over 3,000 PS organizations to provide in-depth analysis of PS metrics and performance. For the 2018 report, 456 companies across ten professional services vertical markets representing more than 158,000 consultants provided input. TOP Step Consulting improves business efficiency and productivity for Professional Services business operations. They help clients achieve their profitability goals allowing them to focus on building their business. Their team has extensive experience in professional services business operations, professional services automation (PSA), and project management. They have served over 300 organizations across the globe and have been awarded “Best-of-the-Best” by SPI Research and named as one of the fastest-growing private companies by Consulting Magazine and Inc. 5000. To learn how TOP Step Consulting brings operational efficiency to Professional Services visit http://www.topstepconsulting.com.